5. Which set of access control entries would allow all users on the 192.168.10.0/24 network to access a web server that is located at 172.17.80.1, but would not allow them to use Telnet? 11. Fill in the blanks. Use dotted decimal format. 12. Drag the descriptions of the packets on the left to the action that the router will perform on the right. 13. Refer to the exhibit. A network administrator is configuring an ACL to limit the connection to R1 vty lines to only the IT group workstations in the network 192.168.22.0/28. The administrator verifies the successful Telnet connections from a workstation with IP 192.168.22.5 to R1 before the ACL is applied. However, after the ACL is applied to the interface Fa0/0, Telnet connections are denied. What is the cause of the connection failure? 16. 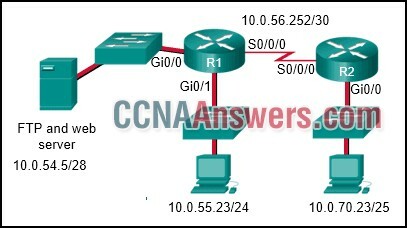 In applying an ACL to a router interface, which traffic is designated as outbound? 18. Refer to the exhibit. This ACL is applied on traffic outbound from the router on the interface that directly connects to the 10.0.70.5 server. A request for information from a secure web page is sent from host 10.0.55.23 and is destined for the 10.0.70.5 server. 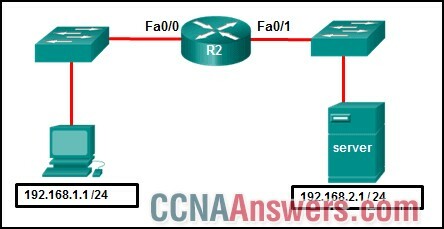 Which line of the access list will cause the router to take action (forward the packet onward or drop the packet)? 21. 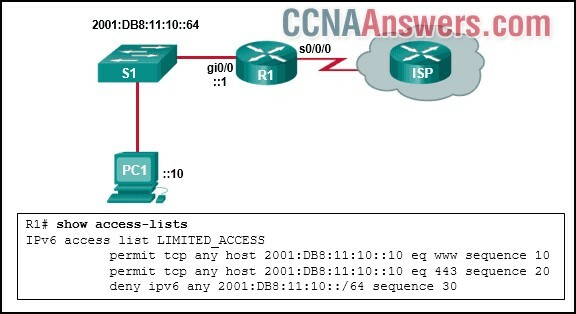 Which feature is unique to IPv6 ACLs when compared to those of IPv4 ACLs? 22. 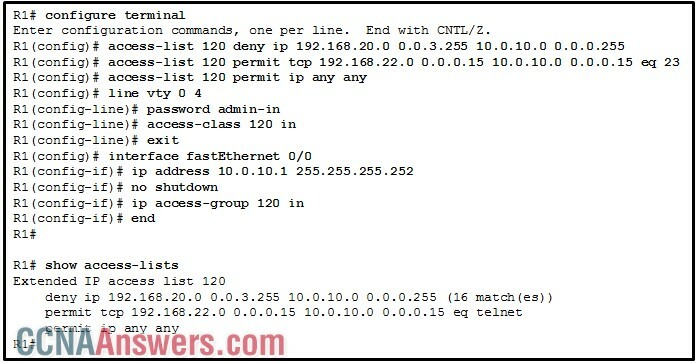 Which Ipv6 ACL command entry will permit traffic from any host to an SMTP server on network 2001:DB8:10:10::/64?